Agriculture is a complex business. Growers must contend with the vagaries of constantly changing climate and markets. Issei joined the local apple growers associations to facilitate getting their crops to market. The Hood River Apple Growers Union and the Hood River Apple Growers Association, formed in 1913, were cooperatives for packaging, storing, distributing, and marketing deciduous fruit crops. Both Japanese and non-Japanese producers were members and served on the board of directors. 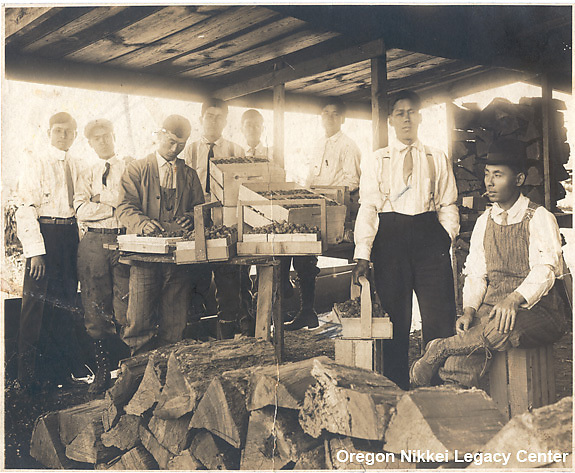 The Japanese Farmers' Association of Hood River (Nogyo Kyokai) was founded in 1914. The Association offered a means to pool capital, share farming equipment and labor, facilitate group contracts, represent Issei unity and business interests, and support positive interracial relations. In fact, Nogyo Kyokai was more than farming. It was about growing a community. Solidarity was an important aspect of the success of the Nikkei community in the valley. Photo: ONLC 792, Gift of Carolyn Brady, Takagi Family Collection.